As with all of our marquees and party tents, this product can be fully customised with flooring and wall and roof linings. We also offer great deals if you are interested in combining a marquee booking with some of our others services, so do get in touch if you would like to furnish your marquee with sparkling light up tables, comfy bean bags, or spectacular lighting. Blackout Roof and Wall Linings. 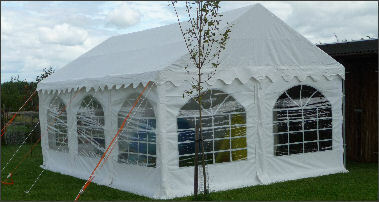 If you require the marquee to be installed on a hard standing area then please contact us for a quotation.